With classic and modern shapes, there’s a Le Creuset kettle to fit into any kitchen design scheme. 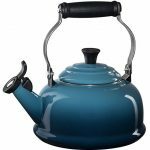 Also convenient to boil water for oatmeal or french press coffee, a Le Creuset kettle is an easy way to add a small dash of color to any kitchen. When filling the kettle with water, only fill water above the first layer of holes on the interior of the spout (see diagram on box for more information). For efficient and safe boiling, always use burner a similar in size to the base of the kettle. 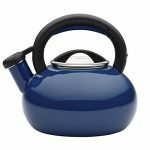 Do not bang the teakettle down onto a stove’s surface or work surface. Repeated banging may damage the exterior enamel. Do not place the kettle on the heat source without having water in the kettle. 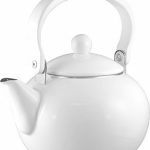 Never leave a teakettle simmering for long periods on any heat source; it may boil dry, which can result in overheating and damage to the base and enamel. Do not leave water standing in a kettle when it is not in use. A buildup of scale may occur and reduce efficiency. 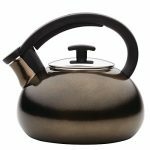 Before pouring from your teakettle, remove it from the burner and ensure the handle is in the upright position. Le Creuset proudly uses heat-resistant plastic on our handles and whistles. Never place in the dishwasher.To clean, simply hand-wash the kettle with hot, soapy water and dry thoroughly. A gentle kettle de-scaler may be used periodically if required.